The 2018 Major League Baseball season saw the Atlanta Braves come out of nowhere to win the National League East. After going 72-90 in 2017, Atlanta would go 90-72 in 2018 as they were a team that spent the first half of the season flying under the radar, but they would ride a wave of momentum throughout the second half of the season that had been created by their young players. And as the Braves were able to sneak up on some teams last year, that won’t be the case in 2019; especially since the National League East could be the toughest division in MLB. After being hailed as the top Major League Baseball prospect heading into the 2018 campaign, outfielder Ronald Acuna Jr. was able to live up his top billing. In 111 games for the Braves, Acuna managed to lead the club in homers with 26. And Acuna was pure excitement each time that he stepped to the plate which would result in him becoming the first Braves players since Craig Kimbrel to be selected as the National League’s Rookie of the Year. But as Braves manager Brian Snitker will look to get Acuna at least 500 at-bats this season, one thing that will need to improve in the youngster’s game is plate discipline. Last season in 487 at-bats, Acuna struck out 123 times, while only drawing 45 walks. And as teams around the National League have had a year to study Acuna’s tendencies, you can expect pitchers to try to get ahead of the count early on him in order to make him chase pitches outside of the zone. However Acuna is not the only youngster for the Braves that has a very bright future as second baseman Ozzie Albies was second on the club last season in homers with 24. And like it is with Acuna, Albies must work on his plate discipline as he struck out 116 times, while only drawing 36 walks and producing an on-base percentage of just .305. But the potential is there for Albies to be one of the best second basemen in the National League as aside from going yard 24 times in 2018, he also managed to crank out 40 doubles. After being limited by injuries in 2017, first baseman Freddie Freeman returned to All-Star form in 2018, while showing that he is still the heart and soul of this team. Freeman is a solid contact hitter who aside from having the potential to hit 30 homers this season, also has the ability to spray baseball around the field. Last season Freeman’s 44 doubles and 191 hits each led the National League. And once you factor in Freeman’s slick fielding at first base, he will once again be in the running to be the N.L. MVP. In three years with the Toronto Blue Jays, we saw the best of third baseman Josh Donaldson as he helped them to a pair of playoff appearances, along with being named the American League MVP in 2015. But injuries curtailed Donaldson’s run with the Blue Jays, and after a cup of coffee with the Cleveland Indians last season, he needed a new baseball home. The Braves signed Donaldson to a one-year deal this off-season for $23 million as they are hopeful that he will be able to rekindle some of the magic that made him one of the best sluggers in baseball just a few years ago. The Braves were able to win the National League East last year, but if they are going to do it again, they will need to get more from their pitching staff. The Braves were able to possess the lowest opponent batting average in the N.L. (229), but they didn’t have a dominant pitcher to lead their rotation. No Braves pitcher was able to win 15 games last season, and their lack of dominance showed up in the team’s playoff loss to the Los Angeles Dodgers. And if Atlanta is unable to find that aspect on this year’s roster, they have what it takes to win the division once again, but this squad needs to find a way to get it done in October. Right out of the chute the Braves will face the improved Philadelphia Phillies who have eyes on unseating them atop the National League East as their youngsters such as Acuna will need to grow up in a hurry for 2019. The New York Mets will begin the 2019 Major League Baseball season fresh off of consecutive losing campaigns, but there is some optimism in the Big Apple that this team will be able to turn things around. The Sandy Alderson era as general manager of the Mets is over as he has made way for Brodie Van Wagenen. Van Wagenen has made the transition from being a sports agent to a front office executive. Van Wagenen has no prior front office experience, but the Mets brass has confident in him to be able to put a competitive team on the field. This off-season Van Wagenen has been busy in regards to wheeling and dealing in regards to improving the Mets roster, and only time will tell if those moves will pay off. The biggest move that the Mets made this off-season was to acquire second baseman Robinson Cano from the Seattle Mariners. Cano began his Major League Baseball career with the New York Yankees, and he appeared to be a lifer in the Bronx. However when Cano hit free agency in 2013, he and the Yankees could not come to an agreement on a long-term deal which paved the way for him to join the Mariners. Cano would put up solid numbers with the Mariners as in parts of five seasons in Seattle, batted .296, while driving in 411 runs. However Cano was never able to help the M’s end their playoff drought, while an 80-game suspension last season for a failed drug test made him expendable. But Van Wagenen believes in Cano as he was the man who negotiated the slugger’s deal with the Mariners, and thus he was ready to work with him again. The Mets and Van Wagenen are hopeful that a return to the Big Apple will be able to reignite Cano’s career. However Cano is 36-years of age, and with nearly $132 million remaining on his contract, this could prove to be another in a long line in bad moves that the Mets have made. Aside from Cano finding the fountain of youth, the Mets are also hopeful that outfielder Yoenis Cespedes will return to being one of the most feared sluggers in the National League. After the Mets gave Cespedes a contract extension at the conclusion of the 2016 Major League Baseball season, Cespedes has been plagued by injuries. Cespedes has only managed to appear in 119 games over the last two years for New York as he’s developed the label of being a player who only shows up at contract time. Cespedes is set to earn $29 million this season and it isn’t a guarantee that the 33-year old will be focused on having a bounce back year. Cano and Cespedes will be vital for a Mets offense that was near the bottom of the National League in most categories which included being 14th in batting average (.234) and hits (1,282), while being 12th in runs scored (676). Aside from having optimism for big years from Cano and Cespedes, the Mets are also hopeful that outfielders Michael Conforto and Brandon Nimmo will continue to develop. Conforto’s 2017 campaign was cut short due to a shoulder injury, but he was able to bounce back nicely in 2018 as he hit a career-high in homers with 28. Conforto has one of the sweetest swings in baseball, and after spending the early stages of 2018 getting his rhythm back at the plate, this could be the year where he puts everything together in order to be considered in the National League MVP race. Like Conforto, Nimmo was a Mets first-round pick several years ago, and he is beginning to come into his own. Injuries last season allowed Nimmo to get extended playing time for the first time in his career and he made the most of his by hitting 14 homers, while also producing an on-base percentage of .404. Nimmo may never make an All-Star Game, but you cannot overlook his hustle as he is a throwback to a different era in Major League Baseball. And as Nimmo’s smile is winning over the baseball fans in New York City, his infectious work ethic is something that the Mets locker room needs. And even though that many teams around Major League Baseball are going away from having a conventional lead-off hitter, the Mets need shortstop Amed Rosario to be their table setter. Last years was Rosario’s first full season with the Mets and he provided some speed on the base paths as he led the club in stolen bases with 24. However Rosario will need to improve on his .295 on-base percentage from a year ago, while also focusing on being a gap hitter at Citi Field. The addition of veteran catcher Wilson Ramos will be a welcome sight to a Mets pitching staff that needs it. Last season New York was 10th in the National League in earned run average with a 4.07 mark, and they need someone behind the plate that is going to take charge. The Mets will be the fifth different team that Ramos has played for, but at each stop along the way he knows how to call a game as well as managing a pitching staff which is something that the Mets need. En route to winning the National League Cy Young Award last season, starting pitcher Jacob deGrom had a season for the ages that will be extremely difficult to replicate. Last year deGrom led the N.L. in earned run average with a remarkable 1.70 mark. deGrom also struck out 269 batters, while setting a Major League Baseball single-season record by giving up three runs or fewer in 29 consecutive starts. N.L. hitters had a very difficult time catching up to deGrom’s deceptive fastball that had plenty of movement on it. I do expect hitters to make adjustments to deGrom for this year, but that will not take away from being one of the better hurlers in Major League Baseball. Starting pitcher Noah Syndergaard led the Mets pitching staff in victories last season, but one thing that he hurt him throughout his brief Major League Baseball career is his inability to avoid the injury bug. Syndergaard has only had one season in which he has made at least 30 starts, while he has never reached 200 innings in any of his four campaigns, and there is no time like the present to change that. At 6’6″, 240 lbs., Syndergaard has an intimidating presence on the mound as he is built more like a tight end for football. Syndergaard has an electric fastball which can easily blow by batters, but what he must avoid is overthrowing. Syndergaard must realize that he does not consistently need to hit 100 miles per hour on the radar gun, and instead he should pick his spots wisely, while also utilizing his curveball, changeup, and slider. And the fact that he has a veteran catcher like Ramos to work with this year, we could see Syndergaard have the finest season of his career. Starting pitcher Zack Wheeler has been a forgotten man in the Mets rotation, but he is coming off of his best season as he won 12 games in 2018. Injuries threatened to derail Wheeler’s career, but he is finally on track and pitching with confidence. Wheeler struck out 179 batters last season due to the movement on his fastball along with his ability to mix up his pitches. Wheeler’s slider has tremendous life to it, and like Syndergaard, he will benefit from having Ramos calling games for him behind the plate. Pitching has always been the hallmark of the Mets franchise and their bullpen has the potential to be the best in Major League Baseball. Along with Cano, the Mets also acquired relief pitcher Edwin Diaz from the Mariners. In three seasons as Seattle’s closer, Diaz recorded 109 saves which included 57 in 2018 which tied Bobby Thigpen for the second most in Major League Baseball for a single-season. But one thing to be weary about is pitchers being able to dominate like this in consecutive years. In 2009, the Mets signed relief pitcher Francisco Rodriguez after his record setting 62-save campaign in 2008 as a member of the Los Angeles Angels, and he was never able to live up to hype as you have to wonder if New York is setup to get burned once more. Last year the Mets traded relief pitcher Jeurys Familia to the Oakland Athletics as no one though that there would be a chance of returning to Queens. However when free agency began this off-season, Familia decided to return to Queens. Unlike Familia’s first time around with the Mets, he is not expected to be the closer as he’ll give New York double indemnity in their bullpen. The Mets are anticipating using Familia in the eighth inning, but as we’ve seen from a club that has aspirations of winning the World Series, you can never have enough arms in the bullpen. New York also has quality long men in their bullpen such as Seth Lugo and Robert Gsellman who will give them one of the the strongest bullpens in baseball as they look to make a run at October. Van Wagnen has given Mets manager Mickey Callaway a solid squad to work with, but New York needs to take care of their business early. In the first month of the season the Mets have series’ with the Atlanta Braves, Washington Nationals, and Philadelphia Phillies, as they’ll need to have a strong start in order to keep up with the stiff competition in the National League East. Since 2012, the Philadelphia Phillies have found themselves in the rebuilding mode. From 2014-2017, the Phillies finished in the basement of the National League East three times as it’s been all about them revitalizing their minor-league system, and that plan appears to be finally coming to fruition. The Phillies spent a good portion of 2018 in playoff contention before a late season swoon squashed their momentum. The Phils would fail to finish the year with a winning record for the seventh consecutive season as they stumbled to a mark of 80-82, but brighter days appear to be on the horizon for one of Major League Baseball’s oldest franchises. Heading into this off-season Phillies owner John Middleton claimed that his team could be “stupid” in regards to spending in free agency in the hopes of making this club a contender. And after spending the majority of the off-season sitting on their thumbs, the Phils front office indeed decided to do something “stupid”, but in a very good way. Outfielder Bryce Harper came into this off-season as the most coveted free agent on the market. 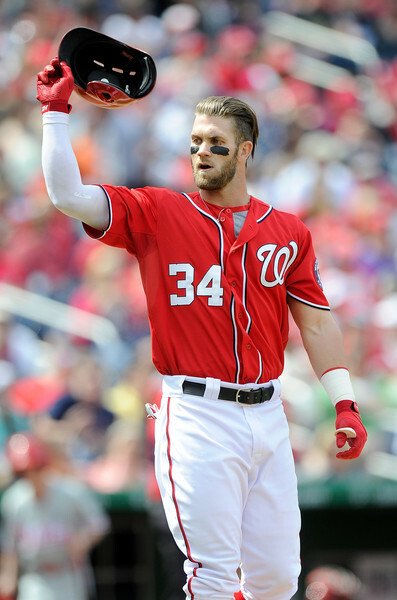 In seven years with the Washington Nationals, Harper was a six-time All-Star, while also having a National League MVP to his credit as well as being named as the N.L. Rookie of the Year in 2012. However in recent years we’ve seen free agency in Major League Baseball take a drastic turn from what it once was. Instead of teams going out their way to spend the big money on star players, teams have become more reserved as the game has shifted to clubs focusing more on the youngsters in a way to push the veterans out of the game. In years past a player of Harper’s caliber would have been wined and dined as soon as free agency commenced, but things were much different this off-season (especially since the Boston Red Sox and New York Yankees were not in the picture). There were teams that still lined up for the services of Harper, but they were not willing to give him the long-term deal that he was coveting. However after free agent infielder Manny Machado agreed with the San Diego Padres on a 10-year deal for $300 million last month, the lines were set as you knew that Harper would not sign for a penny less. And as the bidding war for Harper would come down to the Phillies, Los Angeles Dodgers, and San Francisco Giants, the slugger would ultimately decide on taking his talents to The City of Brotherly Love. Earlier this month Harper and the Phillies agreed to a 13-year deal for $330 million which more than likely signals that he will finish his Major League Career in Philadelphia, but more importantly it shows that this team is ready to compete for a World Series Title right now. Harper’s presence gives Philadelphia a legit presence in the middle of their lineup. What the Phillies are getting in Harper is a player who is just entering the prime of his career at the age of 26, while he has the potential to hit 40 homers as well as being in contention to once again be the National League MVP. And more importantly Harper’s presence should take some pressure off of the youngsters in the Phillies lineup, even though they will be thrust into the spotlight this year. Last year the Phillies were sixth in the National League in home runs with 186, while 34 of those bombs came off of the bat of outfielder Rhys Hoskins. 2018 was Hoskins’ first full year with the Phillies and he showed that he has what it takes to be one of the game’s premier power hitters. Hoskins did strike out 150 times last season which is the offset that you have to accept with most power hitters, but he will benefit from Harper’s presence in the Phillies lineup this season. This off-season Phillies president of baseball operations Andy MacPhail has done a solid job of bringing in quality veteran players to offset the youth that this team has. The Phillies made a splash this off-season when they acquired catcher J.T. Realmuto from the Miami Marlins. In five seasons with the Marlins, Realmuto morphed into one of the better hitting catchers in Major League Baseball. Realmuto has the potential to hit 25 home runs this season; especially since Citizens Bank Park has always been recognized as a hitter’s park. But Realmuto’s biggest contribution to the Phillies will be how he is able to call games behind the plate for the team’s pitching staff. Outfielder Andrew McCutchen has spent the majority of his decade long stint in Major League Baseball in Western Pennsylvania with the Pittsburgh Pirates where he was named as the National League’s MVP in 2013. At the age of 32, McCutchen may not be the player that he was earlier in his career, but what he brings to this Philadelphia club is a veteran presence in the locker room, while also adding outfield depth. McCutchen can still get on his horse when he needs to in the outfield to cover ground as nobody will ever accuse McCutchen of not hustling, and his effort will help win over the always tough fans in Philadelphia. The Phillies will enter the 2019 Major League Baseball season with plenty of firepower in their lineup, but it won’t mean a thing if their pitchers cannot get people out. Last season Philadelphia was 11th in the National League in team earned run average at the clip of 4.14. Starting pitcher Aaron Nola is showing that he is the real deal as in his four years with the Phillies, he has entrenched himself as the ace of this staff. Nola won 17 games last season which included eclipsing the 200-innings mark for the first time in his career as he was selected to his first All-Star team. Nola struck out 224 batters last season, but he also does a solid job of pitching to contact which will put the onus on the Phillies defense to make plays. Last year the Phillies signed starting pitcher Jake Arrieta to bolster their rotation, and he has become a shell of the pitcher that he was when he won 22 games in 2015 with Chicago Cubs. Arrieta is no longer the power pitcher that he was earlier in his career. Arrieta is now 33-years of age, and once you factor in that he is coming off of knee surgery, it will not be easy for Philadelphia to count on him. The signing of Harper will definitely increase the pressure on the team’s manager Gabe Kapler who quickly developed a reputation last year in regards to over analyzing sabermetrics. The Phillies will need to develop chemistry with so many new faces, but even the addition of Harper does not guarantee a trip to the postseason for this club as the National League East is setting up to be a battle. The Washington Nationals will enter the 2019 Major League Baseball season with a new look, but they will still be an organization that has its sights on winning the National League East. The last seven years of Nationals Baseball have been highlighted by the specter of outfielder Bryce Harper. In seven seasons with the Nats, Harper lived up to the hype of being a box office attraction, but he alone was not enough to lead Washington to a World Series Title. Even with Harper as their centerpiece, Washington was never able to win a playoff series which included them underachieving mightily last season as they struggled to win 82 games. But now with Harper as a member of the Philadelphia Phillies, the Nationals must find a way to put that behind them. And as manager Dave Martinez is set to begin his second season in D.C., will he be able to get this club back to the postseason? In losing Harper, Washington lost their biggest offensive threat from 2018 as he led the club in home runs (34), runs batted in (100), and on-base percentage (.393) as the question for this club now is who is going to pick up the slack following his departure? In each of the last two seasons third baseman Anthony Rendon has batted over .300, but can he produce without the presence of Harper in Washington? Rendon once again will hit around .300, while he is also coming off of a season in which he led the National League in doubles (44), and he will once again spray the baseball around Nationals Park. With Harper now in Philadelphia, the Nationals will be relying more on their speed to generate offense. Last season shortstop Trea Turner led the National League in stolen bases with 43 and he is one of the last of a dying breed in baseball which is a true table setter at the top of a lineup. Turner did hit 19 homers last season which were a career-high, but he must concentrate on getting on base due to how his speed can effect the game. And if Turner can stay healthy, while also focusing on becoming a contact hitter, he will be in the running to make his first All-Star team in 2019. After hitting a career-high 36 homers in 2017, injuries curtailed the production of first baseman Ryan Zimmerman in 2018. Zimmerman only appeared in 85 games last season for Washington, and even at the age of 34, he is still expected to be a big part of the Nats offense. It’s highly unlikely that Zimmerman will go yard 30 times this season, but his leadership is the best asset that he brings to the field for this Nationals club. In 2018, Washington’s pitching staff was not as dominant as they were expected to be, but that didn’t stop starting pitcher Max Scherzer from still being one of the best in the game. For the second time in his four years with the Nats, Scherzer led the National League in wins, while also reaching the 300-strikeout mark. Scherzer has been as good as advertised since coming to Washington and 2019 will see him maintain his spot as one of the most dominant power pitchers in the game. The Nationals will begin the season on the road versus the New York Mets before they welcome Harper and the Phillies to town in what will be an important series very early in the season as Washington cannot afford to fall too far behind the pack in what should be a very competitive National League Eastern Division in 2019. For far too long the front office of the Miami Marlins has given the baseball fans of South Florida the dry shave. After both of the Marlins World Series triumphs, we saw the nucleus of those teams traded away as Miami’s front office cried poverty. And now it is to the point that Marlins don’t even get close to contending before they begin to play let’s make a deal. In 2017 we saw the Marlins sold by Jeff Loria to a group which included former New York Yankees shortstop Derek Jeter. This group immediately began to trade away the top players on the Marlins roster which included shipping outfielder Giancarlo Stanton to the Yankees. The few loyal fans that the Marlins have were in an uproar, while the ownership group threw Jeter to the wolves in order to explain the team’s philosophy. What ensued was the Marlins putting a team on the field that was barely competitive at times. Miami lost 98 games which resulted in them finishing in the basement of the National League East for the first time in five years. 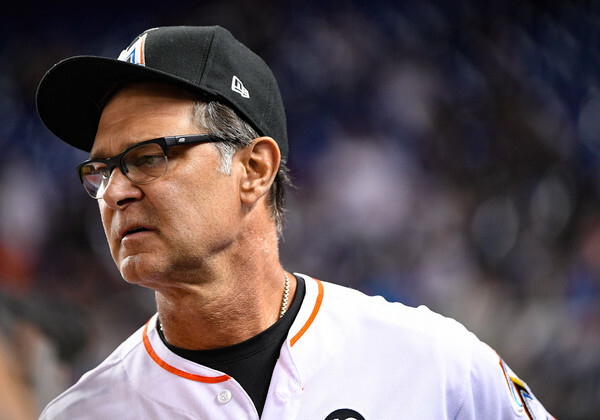 The upside of this was that many young prospects were able to get a taste of playing Major League Baseball as Marlins manager Don Mattingly is hopeful that this experience will be able to propel Miami to an improved season here in 2019. If the Marlins are going to find a way to compete this year, it is going to have to start with their offense. Last year the Marlins possessed one of the worst offenses in the National League as they were last in runs scored (589), and 11th in (1,303) as well as batting average (.237). The one bright spot for the Marlins last season was the presence behind the plate of catcher J.T. Realmuto. Realmuto led the Marlins in home runs (21) and runs batted in (74). Realmuto also earned his first All-Star Game selection, while he is also developing a reputation as one of the best catchers in baseball. But that glimmer of hope has now faded as the Marlins traded Realmuto to the Philadelphia as their lineup for 2019 will resemble that of a glorified minor-league team. Pitching was no better for the Marlins in 2018 as they were last in the National League in team earned run average (4.76), 14th in quality starts (69), and 13th in batting average (.254). Jose Urena was the only Marlins starting pitcher who made at least 30 starts last season, while no Miami pitcher reached double-digits in wins. And as Urena is once again the best option for the Marlins in their starting rotation, don’t expect things to improve that much for this team in South Florida. The Marlins will begin this season with consecutive home series versus the Colorado Rockies and New York Mets, and as they have the potential to fall behind the eight-ball early, the folks in Miami would be in store for another long summer on the baseball diamond.